Face It: My skin would not have survived the winter without this super-hydrating face oil from Aromacentric. My skin literally drinks it up every morning and stays hydrated for the entire day. It’s so pure and natural that when I apply it, I feel like I’m doing something good for myself. 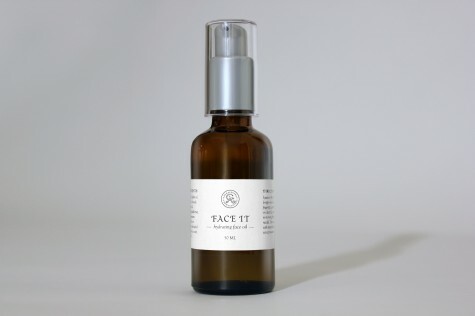 Face It has worked wonders for my normally dry, sensitive skin all winter long. And I wouldn’t have wanted to leave home without it when we went south. Smoothing it onto my face after a day in the sun and swim quenched my skin and made me feel like I was glowing. Also in regular rotation in our bathroom: Aromacentric’s heavenly Eucalyptus, Lemon and Grapefruit Soaking Salts. The perfect end to any day. And, on my desk, right next to my laptop: their Rescue Essential Mist—a calming blend of frankincense, geranium and lavender—otherwise known as a “scent with benefits.” Spritz when stressed. See and sniff for yourself…Aromacentric will be at the Gluten Free Garage on Sunday April 28th! Posted in GFG exhibitor!, Happiness is..., Products we ❤.